I'm just wondering; is this complete fiction, or do you have a source for the $55 billion this would take? NYC is spending billions on the Second Ave. subway & a tunnel to connect the PATH trains from Penn Station to Grand Central Terminal. London is spending billions on its Crossrail tunnel. Los Angeles is about to spend billions on the Subway to the Sea. You have to have something to spend it. Not even Pat Quinn is dumb enough to counter that. I don't think construction workers work on scrip. 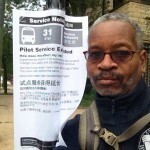 Toni Preckwinkle had her tax rise plan to raise money just for CTA unfunded lack of priorities. What's yours? Fire half of all city, state & county employees. They aren't needed as they don't do a damned thing. Get rid of all the outside lawyers government hires. Abolish the pensions, liquidate the funds to those who paid in & put them all on Social Security. That alone will cause at least a quarter of them to quit. I agree, within Last month that I took Pink Line during the afternoon rush around 5pm from Quincy to 54th/ Cermak, it was an disaster. They need 6-cars badly during the Rush. I wonder does CTA have been getting numerous of Complaints about that. My question is it necessary to expand the yard to run longer trains? Prior to the creation of the Pink Line I thought the Douglas branch ran longer rush hour trains from the existing yard. I would say let Purple Line Express service run until 11 a.m. in the AM rush and run until 8 p.m in the PM rush, and run every 15-20 min between 9am-10pm on Saturdays and 9am-9pm on Sundays (Of course on holidays, it won't run at all). I see only two or three ideas out of all given that sound workable and less disruptive to the unique character of this city and in that light don't simply try to imitate what other cities' transit systems have just for the sake of saying Chicago has those things too. A couple of thoughts come to mind. You're probably going to need to expand capacity of one or more of the current garages, look into using more of the available capacity at 77th for garage assignments if that capacity isn't used for buses that need to go into the South Shops or for buses awaiting the scrap yard, and maybe even add another garage altogether to make an acquisition of 200 artics go even more smoothly than BusHunter probably had in mind. 200 artics still need the storage space of 300 standard buses. We're already getting 300 standard buses at minimum* to go toward the retirement of most of what's left of the 6400s, and since the 1000s would be the next model to be the oldest after the 6400s' retirement, we're not getting new buses as replacements for older ones until the last couple of years or so of this current decade. ** That suggests CTA would probably need to have a plan and funding in place to actually increase bus service to actually have a use for 200 extra articulated buses without having too many of the current buses parked on the sidelines. *We don't know yet if CTA is going to take only the 300 base order of 7900s or take the extra option and bring that total to 450. **Ignoring the current rehab work makes the first options of the 1000s eligible for retirement in 2018 at the earliest, but the millions spent on the rehabs better make this model eligible for retirement further down the road than that. What makes you think that's going to change what CTA gets for capital funding? Chicago's contribution to CTA funding based on what I remember the media reporting has sat at the same paltry level annually (last time I heard that was about $3 million) for more than 30 years probably closer to 40. And that goes to the operating budget and not really the capital budget. The county is currently trying to reverse a lot of the mess Todd Stroger left behind and anything boosting the state's sorry financial status would very likely get called upon to go to paying Illinois' monster backlog of unpaid bills before any of if goes to CTA. Enough to waste on something that would be a total waste, like converting 10 of 11 Metra lines to electric? Nothing wrong with how they run now. The 54 yard has a reported capacity of 108 cars, and people are saying that the Pink Line runs 44. Storage capacity was more evenly distributed when Pink was connected with Blue, but when Kruesi had the idea to reroute the Douglas trains on a reconditioned Paulina connector, the justification then was that there wasn't the passenger load on Douglas compared to half of the O'Hare segment. Then, with Claypool cutting back some Blue Line service to Halsted-UIC, it doesn't appear that Congress balances the O'Hare segment (at least from Jefferson Park), either. Hence, unless the justification is fixing the Tower 18 problem that hasn't been reported for 2 years, the only justification for longer Pink Line trains would be whether passengers are loaded face to buttocks on them, as they apparently are on the Red Line and Brown Line. The latest Ridership Report (Feb 2014) says it is adversely affected by the bad weather, but has the Pink Line up 4.9% over 2013. Still, I think one would have to compare the 17,000 average weekday boardings to the 27,000 on the Lake St. Green Line or 33,000 on the Forest Park Blue Line, all of which serve similar territory, although the Pink Line is shorter in the suburbs. The 12,000 boardings on the south side Green Line, Ashland and Cottage Grove branches combined don't balance anything, which probably explains some rush hour trains from Lake being cut back at Roosevelt. Maybe the south side should be interlined with the Pink and make Lake separate. As far as car storage goes, I don't know if we can take the 7000s spec seriously any more, but you wonder what they were thinking when they were talking about increasing the fleet from 1190 to 1560, or even knocking out the 190 for potential extensions, 1370. Heck, with slow retirements, they must be over 1370 now,. The real problem is that it is much more confused than this. The city $3 million is supposedly for operating, but Emanuel claims that city TIF money goes into such projects as the Cermak and Morgan Green Line stations, and Medical District Blue Line station. On the other hand, the report was that Daley urinated away about $219 million of CTA money on the Block 37 hole to nowhere. Then there is the state money, from the pop, liquor, video gaming, and similar taxes, which paid for the Red Line South reconstruction and Metra Electric cars. However, what has been said lately has been confusing, between that those 5 year programs ran out, or that they are being used, but only for roads. There is no indication that the state funding for the 91 Pace CNG buses ever came through. Then there are the piles of debt, including the RTA and CTA feuding over bonding authority. The CTA bonds are "sales tax revenue fund bonds," which means that sales taxes we thought were paying for operating are servicing those bonds. Pace was also given $100 million of this bonding authority, which is apparently to pay for the new NW garage and other projects, but, again, I'm sure the only security is sales tax revenue. Finally, there is whether the Feds have any money in the gas tax fund, but it seems that Chicago doesn't get any real construction money, between the lack of regional planning and gerrymandered districts resulting in ineffective Congressmen with regard to bringing home the bacon. The real question is what CTA intends with regard to the most recently repeated statement that Wilson will be a transfer point between the Red and Purple Lines. Add to that various studies that, even after being rebuilt, the South Red is light compared to the North side. That combination would seem to indicate that more Purple Line service (or some sort of express alternative to the Red Line stopping every three blocks) is inevitable. And we still don't know if there is going to be another artic order or not. I believe i mentioned in the budget, that they state they want to order 50 (maybe 100) artics. They may end up surprising us and tweak the 150 bus option to get 100 Nova artics. I think the 4000 Series artics could use a rehab like the 1000 Series buses. I don't know if you notice this, but I've been seeing some black smoke coming out of the tail pipes as the buses pull off. That needs to change so that those artics could be like the 4300 Series. I thought I heard they were going to rehab the #4000's after the #1000's. They are just a few years younger. I hope they wake up & replace that horrible bowling alley seat layout with the 4300 seat arrangement. Restore owl service to the level it once was. I thought they completely decoupled the 40 foot and articulated orders and therefore made it more clear that the option for 150 buses extra on the Nova deal is for extra 7900s and not artics. That's what happened with the guy who was trying to get a job at Millennium pointing that out. The last word from CTA on the 50-150 artics was that the procurement was ongoing but an award had not been made. The revised solicitation was theoretically for up to 600 buses over 5 years. Without going into foamer mode, we could always use a BRT line on LSD and a Streetcar/light rail through Michigan Avenue. On north LSD, depends on what CDOT intends to do when reconstructing that. South Side LSD doesn't need it; it seems that 2, 6 and 14 run o.k. As far as light rail, I'm still waiting for the defunct Monroe Circulator. Unless you are talking south of 95th (as an alternative to the Red Line extension that doesn't seem to be happening), that's all what we would need, another means of running over pedestrians north of the River. Also, one would have to figure that any route now on Michigan Ave. downtown pretty much runs elsewhere to the far north or south side. Just for clarification, I was referring to the Mag Mile. South of 95, I'd prefer the red extension. But, on that one, either you would need transfer stations at Oak and Wacker, or it would be redundant of the 3, 140s, and 151 already running there from somewhere else. Light Rail with a south terminal at the Halsted Orange Line station which would then connect with the Cermak stations (Red and Green Lines) and McCormick Place. Leaving McCormick the line could use Metro Shadow's routing to Michigan Avenue. I could possibly see having this line connect with the Clark and Division Red Line station as it's north terminal. Other than the weekend Auto Show shuttle, I don't see the need for it.